Please welcome to the blog today author S.J.A. Turney, 1/7th of the H Team of authors, which also includes Ruth Downie, Stephanie Dray, E. Knight, Kate Quinn, Vicky Alvear Shecter, and Russell Whitfield. 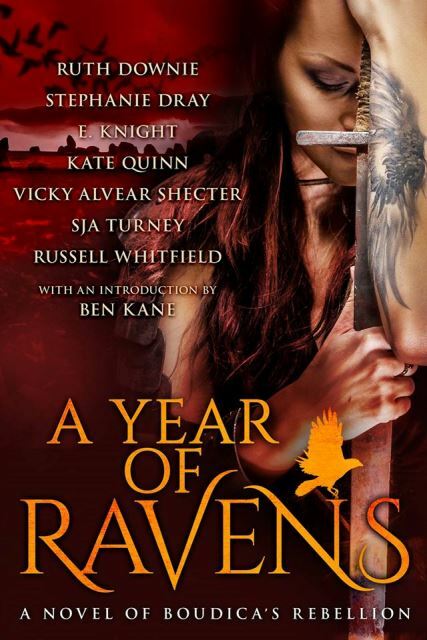 Their recent release A Year of Ravens: A Novel of Boudica's Rebellion is garnering rave reviews so be sure to check it out. Please enjoy the post and don't forget to enter the awesome giveaway below! Objectivity. It’s an elusive thing. Simply, when an author of historical fiction sits down to write about real historical events or people, one of the very first things we have to consider is what stand we are going to take. It doesn’t matter what you’re writing about, there is always going to be a bias. If I’m writing about the Teutoborg forest disaster, do I favour Arminius or Varus? If I’m on the Second Crusade, is Saladin my hero or Richard? You get the idea. We all try to be as objective as we can (unless the story calls for a specific bias, of course) but the simple fact is that one author can never quite attain objectivity. Human beings are naturally subject to bias. Show me a truly objective human and I’ll check to see where they’ve been plugged in. That, of course, is one of the great advantages of writing a collaboration with a group of other folk. With seven authors – even if we are generally a bunch of authors of classical era and ancient world tales – you can pretty much guarantee a variety of viewpoints. And that’s exactly what we had. Among the writers we found a wide variety of opinions on the revolt, its characters, and how it progressed. There was sympathy for the beleaguered Romans of Colchester as they died horribly under native blades, and also for the last flicker of the Druidic tradition being extinguished by the legions at Mona. How to reconcile such opposed positions was one of the biggest challenges in the book and yet it was the very confronting of that problem that allowed us to remove natural levels of bias. In fact the discussions between the seven of us as to how anything worked or came about were probably longer, wordier and more in-depth than the finished book! The decision to write the tale from a variety of viewpoints, taken from both sides of the conflict, has created a level of objectivity that none of us alone could have hoped to achieve. A collection of fairly subjective tales has together created an overall objective story. Heck, in my own tale alone there is as much conflict between viewpoints as anywhere in the book. This is because I have long been a student of Roman history and a writer of Roman military works, and when I was offered a brief to write some of the most vicious and harrowing parts of the revolt from the viewpoint of a Celt, my mind spun. How I could possibly take the Iceni’s side was beyond me, partially given my leanings towards Rome, but also the fact that the scenes I was to cover are to me the moments that highlight the brutality and barbarism of the natives during the revolt. A quandary. And so Andecarus was born in an attempt to create objectivity where there could be none. An Iceni warrior with a Roman past. A man of two worlds caught in the conflict between them. This gave me the opportunity to try and achieve the impossible: to become objective. Of course, I couldn’t quite do it, even with such a conflicted character. Check… there’s no plug and cord. I’m human, and I lean to the Roman angle. Again I was saved by the presence of my co-writers. I created a tale for Andecarus which was biased towards Rome despite my best efforts, and yet scenes, conversations and moments within it were tweaked at the suggestion of my peers, dragging Andecarus gradually towards that elusive objectivity. Thus the other six writers helped me achieve the impossible and made my naturally biased tale more or less objective. And the fact that Andecarus threads through the book in scenes both Roman and native gives him even less bias. The influence of six other authors on any single tale in the book has created overall a rounded, more objective point of view. Even where some tales in the book are subjective and biased, they are balanced with similar stories from the other side, and often even the most ardent supporter of either side is given moments of pause where they consider the ethical implications of what they do. I think this method has created in A Year of Ravens an almost unique level of detachment and impartiality. Britannia: land of mist and magic clinging to the western edge of the Roman Empire. A red-haired queen named Boudica led her people in a desperate rebellion against the might of Rome, an epic struggle destined to consume heroes and cowards, young and old, Roman and Celt . . . and these are their stories. A calculating queen sees the sparks of revolt in a king’s death. A neglected slave girl seizes her own courage as Boudica calls for war. An idealistic tribune finds manhood in a brutal baptism of blood and slaughter. A conflicted warrior hovers between loyalty to tribe and loyalty to Rome. A death-haunted Druid challenges the gods themselves to ensure victory for his people. An old champion struggles for everlasting glory in the final battle against the legions. A fiery princess fights to salvage the pieces of her mother’s dream as the ravens circle. A novel in seven parts, overlapping stories of warriors and peacemakers, queens and slaves, Romans and Celts who cross paths during Boudica’s epic rebellion. But who will survive to see the dawn of a new Britannia, and who will fall to feed the ravens? During the Blog Tour we will be giving away a Celtic inspired set of silver tone metal and red Swarovski crystal beads, including a necklace, bracelet, and earrings inspired by the setting of A Year of Ravens! Please enter the giveaway via the GLEAM form below. – Giveaway ends at 11:59pm EST on December 18th. You must be 18 or older to enter.